I think we all have those days where we simply don't feel like cooking. Not necessarily a big deal... unless it's getting late and you have a brood hovering around, eyes wide with hunger and tummies growling. Yet even without the pressure and responsibility of getting something on the table for a family, this cooking apathy can be frustrating. Particularly if you are like me: you enjoy good food and have a slight aversion for eating just anything. I was feeling this way one night last week and it was getting a bit late in the evening to mess around with too many ideas. Eventually my desire for something tasty outweighed my sluggishness and I decided to pull out "the binder." I thought this little pasta fit the bill... it's quick and satisfying (with chicken, veggies and pasta all in one dish) but, best of all, its great Mediterranean ingredients (lemon, garlic, onions, peppers, and tomatoes) make it wonderfully light and fresh. When I scanned my fridge and pantry and realized I had all the ingredients BUT the italian parsley I begrudgingly ran to our nearby Trader Joe's just so that I could complete my mission. Going from "don't feel like cooking" to actually running out at the nth hour to get a necessary ingredient? What a sorry cookie! But once the taste buds get going, it's a done deal. 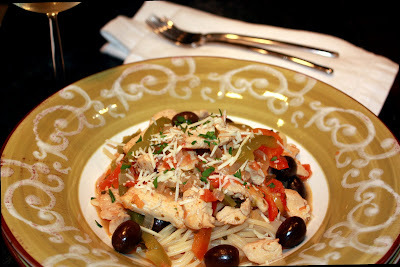 The funny party of this effort was my realization that the original recipe wasn't even a pasta! I've made this dish enough times over the years that I rarely look to the original recipe anymore. I forgot I made this adaptation... and also have no recollection which mag I clipped it from. In addition to some changes in seasoning, I added a broth to kind of bring the whole thing together. The broth has a nice, subdued lemony tartness and a mellow bite from the red pepper. And, what about that fresh italian parsley I deemed a "must have?" Definitely worth it! It adds a light herby freshness that enhances the dish beautifully and reinforces its Mediterranean flavors. Apart from cooking up your pasta, the dish easily comes together in one skillet. That's always a good thing! 1. Bring water to boil in a large pot. Add a handful of salt to season water and drop in pasta. Cook for approximately 9 to 11 minutes, until pasta is al dente. Remove and drain. 2. Heat oil in a large, deep skillet over medium heat. Add chicken, sprinkle with salt and pepper and cook for approximately 15 minutes, until lightly browned. Reduce heat. 3. Add 1/2 lemon, 1/2 tomato, garlic, onions, parsley, and oregano to chicken. Sprinkle mixture with ground red pepper. Add wine and chicken broth. Cover and simmer for 15 minutes. 4. Add remaining tomato and lemon. Add peppers and stir to mix ingredients lightly. Cook covered for another 5 to 10 minutes, until peppers are just crisp-tender and chicken is cooked through. 5. Plate pasta and top with chicken/veggie mixture. Sprinkle with fresh parmesan cheese and a bit of chopped parsley and serve.